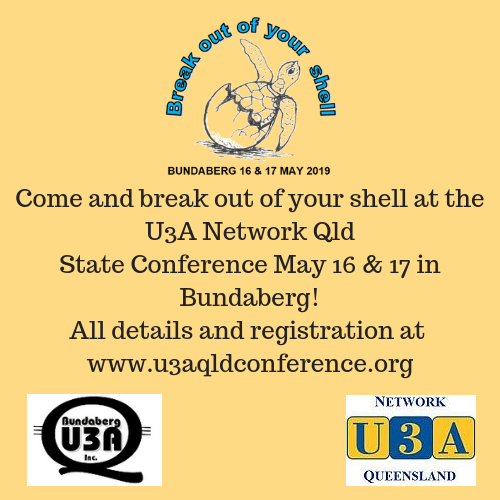 U3A Bundaberg is delighted to host the 2019 U3A Network Qld State Conference and Annual General Meeting on Thursday 16th May and Friday 17th May 2019. It Is 31 years since U3A Bundaberg was founded in 1988. We are pleased to welcome delegates from U3As throughout Queensland and interstate. We are pleased to be the first U3A to host a Network AGM outside south-east Queensland. The 2019 Conference will be held at The Waves Sports Club, 1 Miller St Norville (see map for location). The venue is single level with undercover parking with no time restrictions. The venue is a short drive from both the airport and the train station and many of the accommodation options suggested. The conference venue is also the venue for the Conference Dinner. The Program is available on the Program page. Speaker biographies will be provided in due course. Conference Newsletters will be circulated to U3As in the months leading up to the Conference. Subscribe to our mailing list to receive conference updates. Welcome Function Wednesday 15th May 6.30-8.00pm at Cane Cutters Kitchen, Sugar Country Motor Inn, 220 Bourbong St. Cost $15 per head, payable at the venue. The Cane Cutters Kitchen is at the Sugar Country Motor Inn at 220 Bourbong St, across the railway line from the railway station. It is the conference room for the Sugar Country Motor Inn. Finger food will be served and drinks will be available at the bar at members' expense. As part of your introduction to the Bundaberg area, we have organised a bus trip to the Bundaberg Rum Distillery. This venue was given the seal of approval by Prince Charles when he visited about 12 months ago. The cost of entry into the venue will be covered in the fee for the trip. There will be time for a rum tasting at the end of your tour. We will also be having a drive around the area with full commentary about the agriculture and some history of the area. You will have panoramic views of the area from our one and only hill, the Hummock. Lunch is at delegates' expense on the day. River Walk and Breakfast Friday 17th May at River Cruz Cafe. Meet 7.30am at Alexandra Park rotunda. 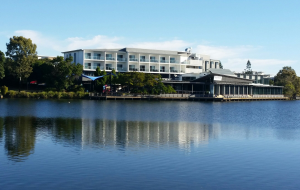 Walk along Riverway to River Cruz Cafe - is 1.5km, easy half hour, small rise, boardwalk at cafe end - suitable for powered wheelchairs. River Cruz opens at 8am - has full breakfasts and coffee/snacks. Toilets are suitable for people with disabilities. Free wi-fi available. Walk back the same way, drive to The Waves and arrive at the conference at about 9.30. If not attending the conference you can explore the city from River Cruz. A local U3A member will be guiding the walk and can tell you anything you need to know! You can select these options on the Registration Form. More information about all of these activities is available on our Optional Events page. A web tile/image is available for use on websites to promote the conference. The 2019 conference is organised by a Project Team from U3A Bundaberg led by Beverley Hoult.